Two Skolkovo startups made international headlines earlier this year when they announced that they were working together on a 3D printer for the International Space Station that would be able to print satellites directly in space. Several months later, the companies have a preliminary prototype that was recently inspected by President Vladimir Putin, the team at work on the printer told Sk.ru in a recent interview. The U.S. section of the International Space Station already has a 3D printer, but Sputnix, which makes microsatellite components and technologies, and Anisoprint, which is working on a 3D printer using fibre-reinforced plastics, promise that the capabilities of their joint project will exceed those of the U.S. printer produced by Made In Space. While the U.S. printer creates objects out of plastic and is intended primarily for making supplementary tools and device prototypes, introducing continuous fibres into plastic means the Russian printer will make objects that are more than 15 times stronger – including ready-for-use satellites, its creators promise. The joint project was launched at the initiative of Sputnix, a resident of Skolkovo’s space cluster that launched the first private Russian remote sensing microsatellite in 2014, said Antonov. "People, including our potential clients, think of 3D printing – especially FDM – as a prototyping tool. On our printer, there’s no need to make a prototype. Our printer isn’t for that, it’s for making final products." “It started off with them wanting to print a couple of parts for their Avrora satellite, then they had the idea of making a printer for the ISS,” he said. “We are very interested in the prospect of additive manufacturing [3D printing] in space, we believe it’s the technology of the future,” Andrei Potapov, general director of Sputnix, said earlier this year. “Many people are aware of the idea of producing new materials in orbit, from construction parts right up to ready-made spacecraft – even asteroids are being considered as a possible source of material,” he said. “Making these plans a reality entails overcoming a lot of technical obstacles. Rather than wait for an asteroid to be delivered into Earth’s orbit, we decided to devise elements of technology for making and assembling satellites in space,” said Potapov. 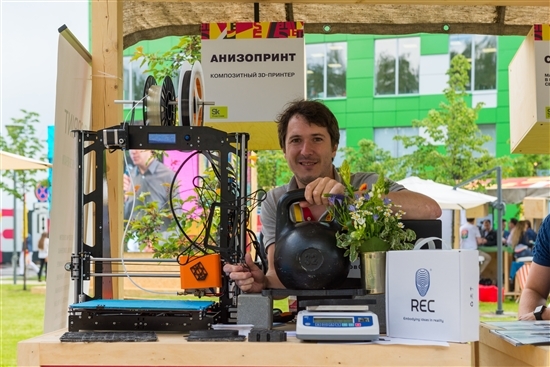 Fyodor Antonov shows off a prototype of Anisoprint's 3D printer and a durable product printed on it at the Startup Village at the Skolkovo innovation centre in June. Photo: Sk.ru. But why go to the effort of creating a printer that can make satellites directly in orbit when they are already made and successfully launched from Earth? If a satellite didn’t have to go through the various tests of endurance entailed by a launch from Earth, it could be designed quite differently, says Antonov. “Most of the criteria according to which satellites are designed are governed by their launch and conditions in the launch rocket. So the main body has to be quite sturdy, because there are strong vibrations. If we make a satellite on board the ISS, it will never be subjected to those vibrations,” he said. “And the vibrations don’t just affect how the satellite is made; they affect the electronics too. So it can be made much lighter, and the mass of materials needed is much smaller and that’s economically profitable,” he explained. "Our only hope is that this is a very media-friendly project, and Roscosmos also needs some success stories that everyone around the world will hear about." Satellites that don’t have to go through the launch process would also be less likely to encounter problems in their functioning, says Antonov. “Satellites in space may suddenly stop transmitting information, even though they were of course tested a thousand times on Earth. That means something happened during the launch: to put it in basic terms, a wire got disconnected,” he said. The idea of producing satellites in space is not without downsides, however. The cost of an astronaut’s time is infinitely greater than that of a regular engineer on Earth, acknowledges Antonov. “The astronaut will have a ton of other experiments to work on in addition to yours, and their time is scheduled very precisely, so it’s important that putting the satellite together should take up as little of their time as possible,” he says. This requirement is in keeping with Sputnix’s approach to building satellites. “If right now, satellites are made for individual purposes and planned for several years, as each one is unique, the idea of constructor satellites is that there is a universal main body and choice of module blocks that can be added and put together by a non-specialist in a few hours,” explains Antonov. Schoolchildren work on making the 3D printer space-worthy at the Sirius educational centre during the summer. Photo: Fyodor Antonov. While the satellites would not have to undergo the launch, the printer itself would, and accordingly, Anisoprint has its work cut out making sure its final product will be space-worthy. It recently got the chance to put its prototype through the paces at the Sirius educational centre for gifted children in the Black Sea city of Sochi, where the company organised a summer course devoted to space systems. 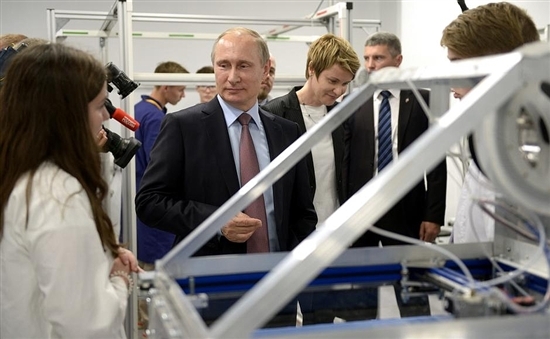 President Vladimir Putin inspected the work in progress on the printer prototype, in which the children took part, when he visited the camp in July. The children’s centre, with laboratory facilities housed in a building originally built as a media centre for the 2014 Sochi Winter Olympics, featured a space systems lab set up with a vibrostand, and other equipment to which Anisoprint does not usually have access. “It was really useful for us, we had free access to all the equipment. We prepared samples of material on the printer, and tested them in a thermal-vacuum chamber,” said Antonov. Antonov, who in addition to running Anisoprint also teaches design at Moscow Polytechnic University, was full of praise for the children at Sirius, saying that the skills of the 15 and 16-year-olds in his group were comparable to those of his university students. "Satellites in space may suddenly stop transmitting information, even though they were of course tested a thousand times on Earth. That means something happened during the launch: to put it in basic terms, a wire got disconnected." “We took a functioning 3D printer that would be able to print solar battery panels for Avrora, the first private space satellite, and gave the children the task of being able to tell the visiting experts that the printer could be launched on ISS and it would work,” he said, conceding that it was a difficult task to solve in two weeks. The Anisoprint team also gained valuable insight from visits to Sirius by experienced cosmonauts who have been on the ISS, said Antonov. “They have seen the Made In Space printer at work. It was really interesting to hear from them that, for example, it smells really bad when it’s in use,” he said. Anisoprint, which was formed in 2015 by postdocs at the Skolkovo Institute of Science and Technology (Skoltech), has not yet solved the problem of dealing with its own printer’s gases. “When the printer is in use, it uses molten plastic, and some gases are emitted,” explained Antonov. “We need to determine what is emitted and what to do about it, so as not to pollute the air on board the ISS and not put an extra strain on its ventilation system,” he said. The company also faces the challenge of overcoming popular conceptions about 3D printing. “People, including our potential clients, think of 3D printing – especially FDM (Fused Deposition Modelling, the technology that their printer will use) – as a prototyping tool. We say: ‘On our printer, there’s no need to make a prototype. Our printer isn’t for that, it’s for making final products,” says Antonov. Antonov pictured at work in the Anisoprint lab. Photo: Skoltech. Despite the efforts Anisoprint is putting into developing a space printer, the joint research product with Sputnix is not the company’s main area of activity. Its main product is a 3D printer for making composite materials, which is at the prototyping stage. “Most of our [potential] customers are small tech companies that make drones, robotics technology, for example,” says Antonov. “There is a trend now for affordable industrial robots. 3D printing is a big trend in medicine right now too: we’ve seen interest from a company that makes prostheses. Our task before the end of the year is to get the production line of our basic printer in place,” he said. The company is also seeking to enter Western markets via partnerships with companies already operating on those markets, he added. To this end, Anisoprint regularly takes part in international trade exhibitions on 3D printing and composite materials with the help of micro-grants from the Skolkovo Foundation. For now, the company is focusing on its earthly activities while keeping one eye on the stars. There is no guarantee from Roscosmos, the state space corporation, that it will commission the company to make the printer for the ISS. There are strict regulations for carrying out experiments on the ISS, and private companies must present their projects to a scientific council. Even if the printer is approved, it could be a lengthy process. “We spoke to a company that has almost completed the process of getting approval from Roscosmos to introduce its technology, and it took them three years,” said Antonov. “People who know about the documentation process say on average it takes five years,” he said, adding that the U.S. company Made In Space got permission from NASA in two years. “Our only hope is that this is a very media-friendly project, and Roscosmos also needs some success stories that everyone around the world will hear about,” he said with a smile.